Skill, boredom, stupidity? Maybe all of them? Take your pick. the better question is how many geeks did it take to build it? I would say it would take a minimum of 4 people to do that, maybe 3 if they are very skilled. Stacking plastic boxes requires special skill? Who knew? 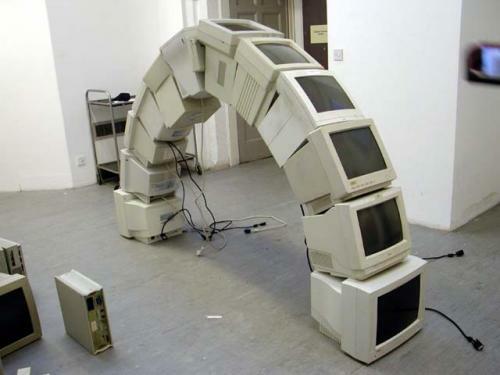 Three people could easily do this in a few minutes, unless the bottoms of the monitors are made of a new, super-slippery plastic. But it does have an air of pointless imagination, which makes me smile. They need to edit in a monitor city!